Winnifred Gilman grows to 3' tall and wide. It's noted for its dark ruby red flower stems and intense violet flowers which bloom from May to July. Cleveland sage puts on most of its growth in late winter and spring, then goes summer dormant. Ideal growing conditions include good drainage, full sun, good air circulation (don't plant it too close to other plants) and very little summer water once it's established. In The New Book of Salvias - Sages for Every Garden, writer and salvia guru Betsy Clebsch reports that Winnifred Gilman sage was first distributed in 1964 by Strybing Arboretum (now the San Francisco Botanical Garden at Strybing) at one of their annual plant sales and was named to honor one of their volunteer propagators. 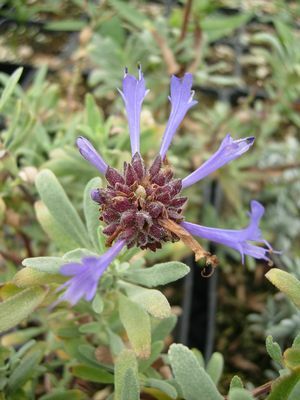 In 1989, in the Berkeley California garden of Jenny Fleming, a mature plant of Winnifred Gilman was noticed by Sherrie Althouse and Philip Van Soelen, owners of Cal Flora nursery in Santa Rosa. They took cuttings and, since 1990, plants have been readily available from Cal Flora and many other nurseries. Winnifred Gilman's a compact and colorful selection of Cleveland sage (Salvia clevelandii). It grows to 3' tall and wide. It's noted for its dark ruby red flower stems and intense violet flowers which bloom from May to July. The adjacent close-up photo of the flower doesn't do it justice; the color's really much more intense. Cleveland sage puts on most of its growth in late winter and spring, then really slows down in the summer. Ideal growing conditions include good drainage, at least half a day of sun, good air circulation (don't plant it too close to other plants) and very little summer water once it's established. If your soil drains really slowly, I suggest creating mounds in your garden for plants like Winnifred Gilman that really don't like having their roots wet all the time. I love the intense indigo of the flowers, but find the plant a little unpredictable to grow. Sometimes it thrives, sometimes - given the same growing conditions - it doesn't. That fabulous indigo keeps me trying though! Like some other salvias, Winnifred Gilman has quite brittle stems and often doesn't resprout if the branches are broken off at the crown. Therefore, I don't recommend it for gardens where there are exhuberant dogs or where it's likely to be hit by balls! Prune in late fall or early winter to prevent bushes from becoming too woody at the base. Aim to create a fairly symetrical, rounded shape that's not congested in the middle. Cut back any branches that are rubbing against each other, or growing toward the middle of the bush. I like to reduce the overall size of the bush by up to a third.